The salary of a CNA in Idaho varies with the geographic area, number of working hours, education level, work schedule and the experience and expertise they hold. As per the U.S. Bureau of Labor Statistics, the mean hourly and annual salary in May 2013 was $10.93 and $22,730, respectively. 7,520 nurse aides were employed in ID and employment per 1000 jobs was 12.27. According to indeed.com, in December 2014, the average annual CNA salary in the state was $16,000, which was 34% lower as compared to the average CNA salaries for job postings on a national scale. 90% of CNAs offered less than $29,930; 10% were offered more than $29,930. 75% of certified nurse assistants earned less than $26,400; the remaining 25% earned more than $26,400. 50% were remunerated with an amount less than $22,230; the rest of 50% were remunerated more than $22,230. 25% of CNAs were paid less than $18,970; 75% were paid more than $18,970. 10% of employees were waged less than $16,790; 90% were waged more than $16,790. After examining the table, it can be observed that Twin Falls is the lowest paying city, with median monthly and weekly salary of $1,880 and $434, respectively. 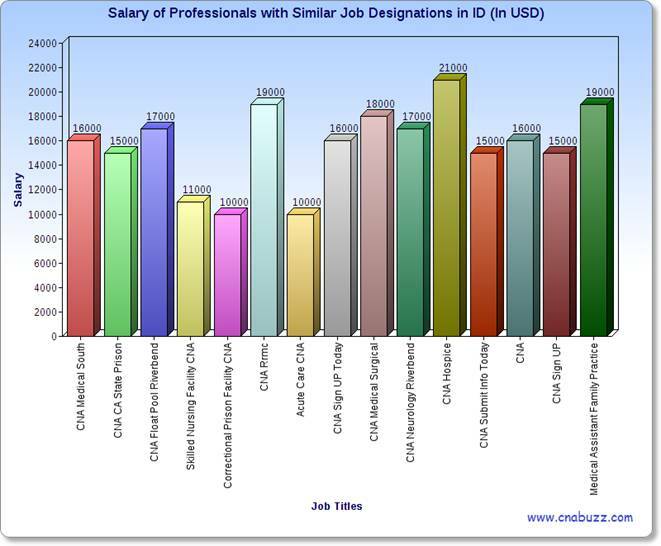 The median hourly salary in ID ranges from $11 to $13, whereas the median annual salary varies from $22,566 to $26,353. The responsibilities of a nurse aide depend on their designation. In December 2014, CNA Hospices were the highest paid professionals with the salary of $21,000. Medical Assistant Family Practice and CNA Rrmc got $19,000. Others managed to obtain between $10,000 and $18,000. The demand for certified nursing assistants has been increased enormously throughout the USA, due to the advancements in technology in the healthcare sector. Even in Idaho, the employment opportunities for CNAs is expected to take a high leap by 2022 (according to the BLS), which will certainly be advantageous as well as encouraging for all the aspirants. In the nursing sector, CNAs, who are ready to accept the challenges and learn new medical technologies, always get better promotional opportunities. Question 1 – At present, I am working as a CNA in the state of Washington, but due to some personal reasons I am planning to shift to Idaho. What salary package can I expect in the state? Answer – In Idaho, one can expect an average salary of $16,000 (according to indeed.com). Question 2 – Does anyone know the top paying job titles in Idaho? Answer – CNA Hospice received the highest salary of $21,000.